Ideal for use at home or in school, Skoldo is a popular introductory French course for young children. Printed in full colour, it is beautifully clear with attractive illustrations and simple conversations. Audio files for all of the songs and conversations in this book can be downloaded free of charge (details included in the book). 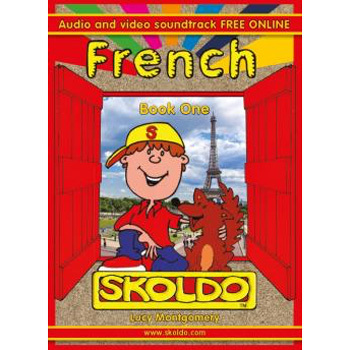 Skoldo French Book One is an activity book suitable for beginners from 6 - 10 years old (Key Stages 1-2). It contains 160 words to learn through simple activities. Basic grammar and conversational French is also introduced. Skoldo French Book One is suitable for early language learning and would be an ideal follow-on the the Skoldo Elementary French book. The level of language used in this book is fairly simple so this could also be used with complete beginners. Parents wishing to use this book with their child would benefit from having a little knowledge of French. A complete English / French vocabulary list is provided at the back of the book.